Many burglaries are opportunistic in nature but don’t confuse spontaneous for rash: even if a house seems a likely target at first glance, most will still make a number of checks before fully committing to breaking in to the house. Knowing what these checks are can help you lead any would-be burglar to conclude that it’s not worth his while. Can he see things that are worth stealing through the window? He’s particularly looking for items that he can pick up and take easily and sell on. Phones, tablets, cameras, jewellery, games consoles, bank cards and, obviously, cash are their favourites. What you can do: Hide these kinds of objects away from windows. Your home may as well be a shop window if you leave such tempting items within view. You should do this even if you’re in the house as some will attempt a break in even if people are home (either by sneaking in or by distraction) or they could return later. Put items away out of sight or ideally lock them in a safe when not in use. Ideally, burglars would prefer an empty house so that they can break in without being disturbed and take their time when they get inside. They’ll look for signs like lights and noise and whether there’s a car parked outside. What you can do: Try to make your home look occupied when you’re not there. Leaving the TV or a radio on, lights and curtains on timers and even having a neighbour park their car on your drive when you’re on holiday can help to create the impression that there’s someone home. Of course, some will have a go anyway, so this alone will not deter everyone. While the common misconception is that a burglar will break windows or smash locks to get in, many will gain access through an unlocked door or window. 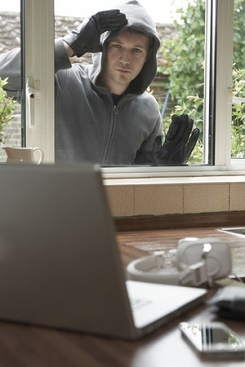 A burglar will check the obvious first; are there any windows or doors open? Are any doors unlocked (some will check them)? Failing that they will look for items around the house that could help them break in eg gardening tools, ladders, garden furniture, heavy plant pots that can break a window etc. They’ll also look for secluded corners where they can work unnoticed. What you can do: First and foremost; make sure you keep doors and windows closed and locked, even if you’re in. Lock tools and equipment in a garage or out-building, weight garden furniture down so that it can’t be dragged closer to the house and keep hedges and trees cut back so they can’t give cover to anyone up to no good. While it’s not necessarily something that a burglar can check before attempting to break in, it’s certainly worth upgrading your locks to anti-snap security locks so that even if they attempt to get in via ‘lock-snapping’, they won’t be able to gain access. Evidence suggests that most burglars would choose a house with no security protection over one that has measures in place. They will look for obvious things like burglar alarms and CCTV cameras and they’ll also pay attention to whether they look properly maintained. What you can do: Get some security protection in place! A burglar alarm is recommended and CCTV will also offer a visual deterrent. If you have these things you can make them even more obvious by displaying signs on your property. Obviously, no burglar wants anyone witnessing their break in so the busier the street, the less likely they are to try something. What you can do: This is where community spirit plays a role. Increasingly, people tend to keep themselves to themselves with few knowing their neighbours beyond a quick hello in the street. We can all make a difference to reducing crime in our communities by keeping an eye out for each other. Having a visible presence on our streets and looking out for suspicious behaviour will have a big impact. Social media can also be a great vehicle for showing that people are focused on keeping neighbourhoods safe (many burglars will monitor these). The more of these counter measures that you can put in place, the less likely a burglar will assess your home as a viable target. If you would like any further advice about your home security, call us on 0345 833 5543 or call into our security shop in Wakefield.